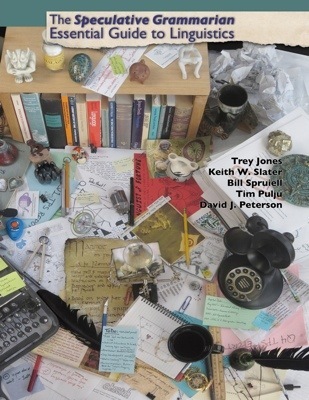 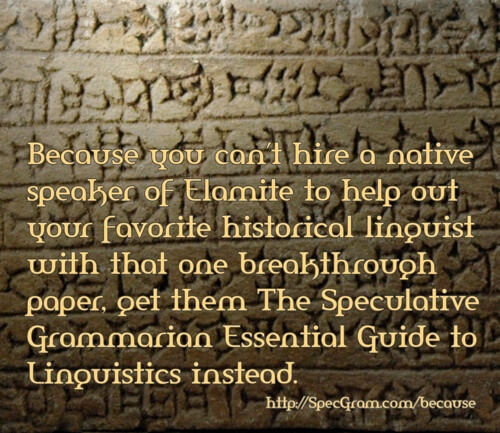 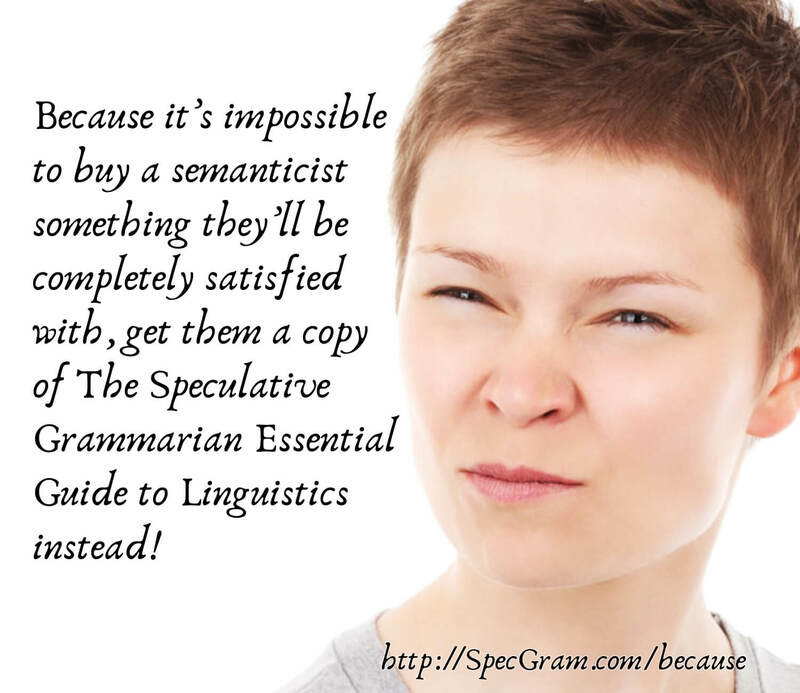 Give the gift that says, “I don’t really know what you want, my dear linguist, but I’m trying!”—The Speculative Grammarian Essential Guide to Linguistics. 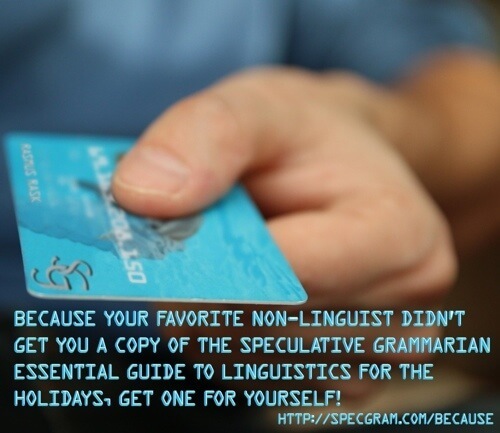 We all want to make our loved ones happy—but that isn’t always possible. 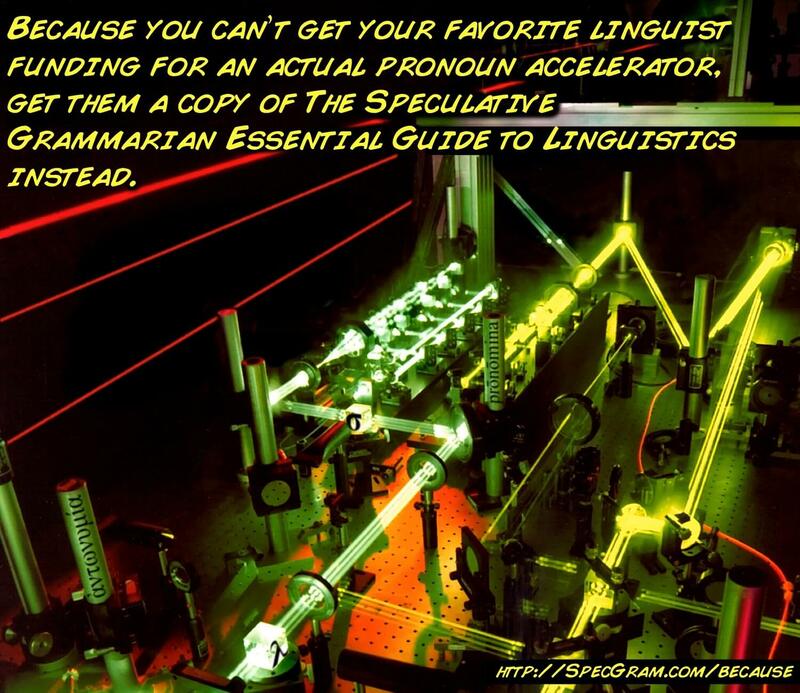 With linguists, it can be particularly difficult, because—let’s face it—linguists are a difficult bunch: they talk funny, they ask silly questions, and they get excited about the most ridiculous things. 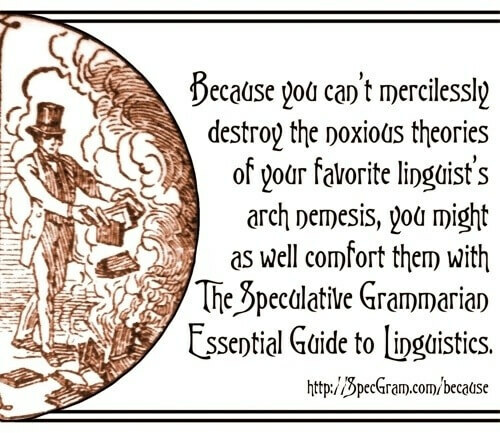 “Ooo! Socio­morpho­phonetics!” What does that even mean? 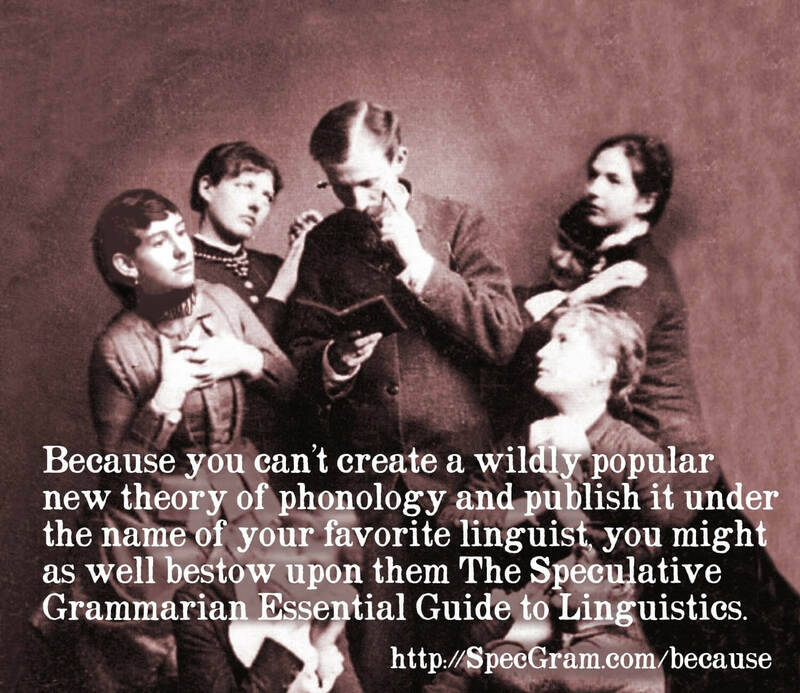 We could try to help you understand a linguist’s needs and wants and desires—but we’d have to give you a mini course on semantics, pragmatics, and socio­morpho­phonetics first. 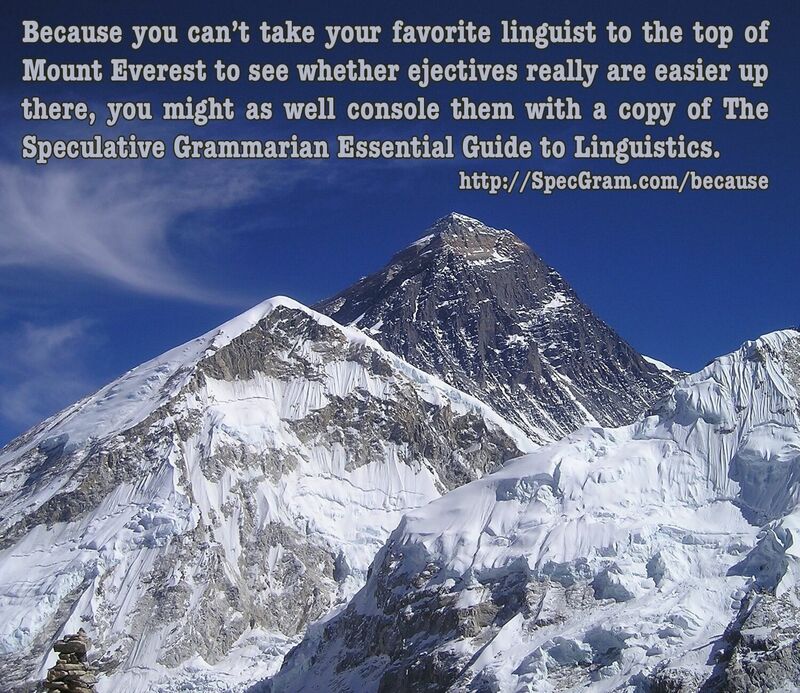 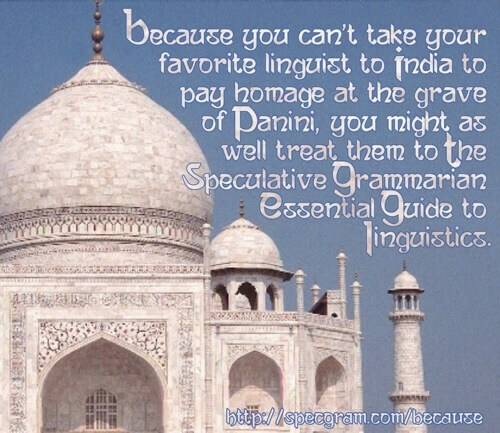 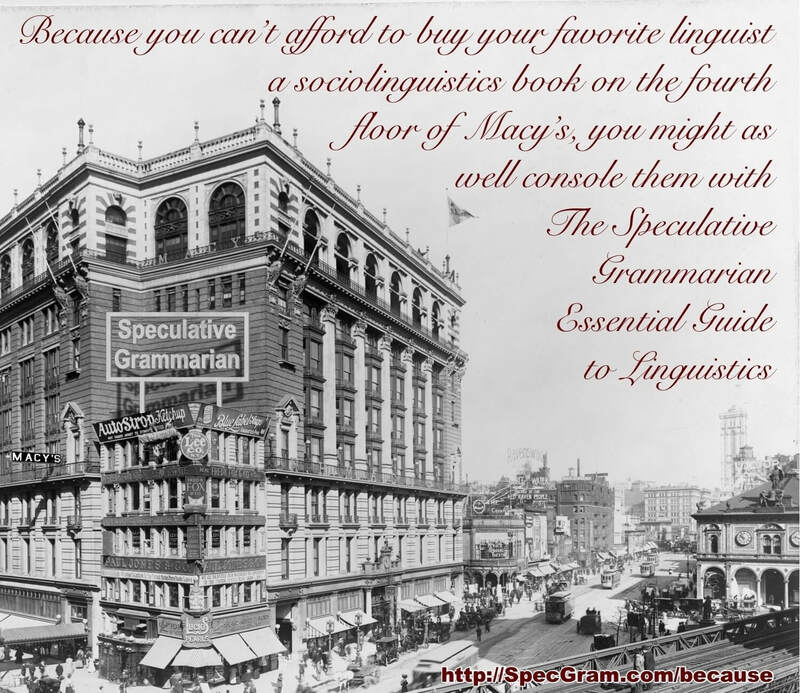 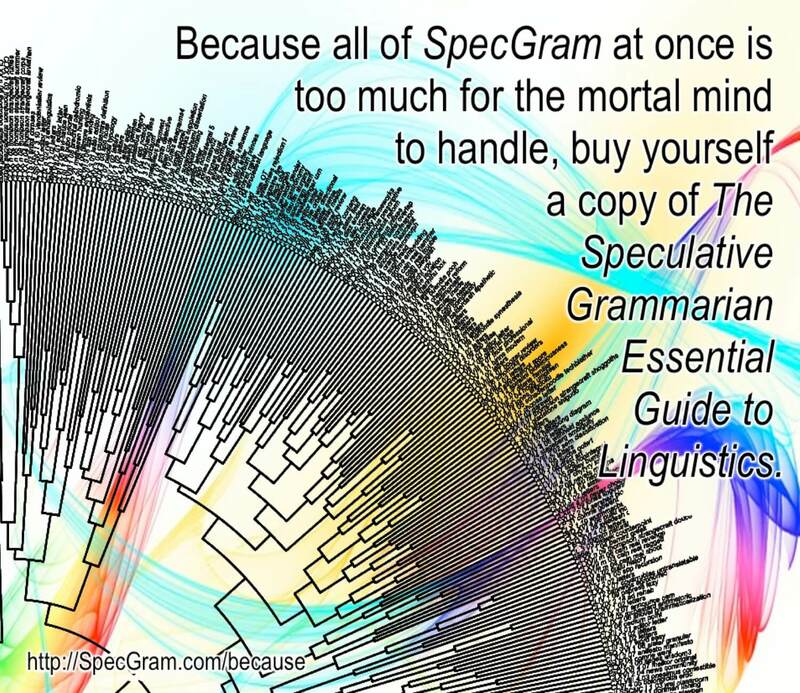 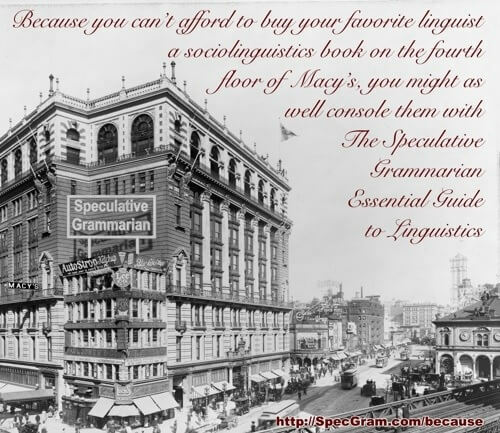 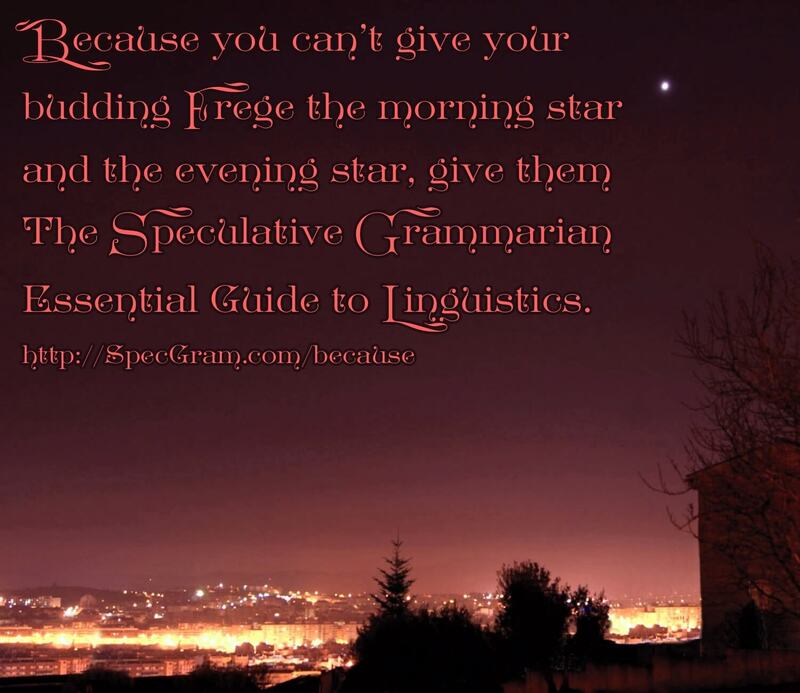 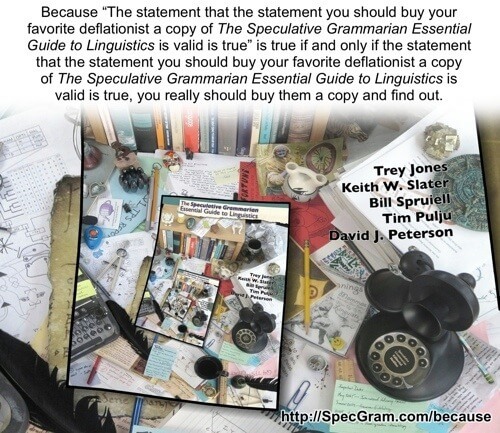 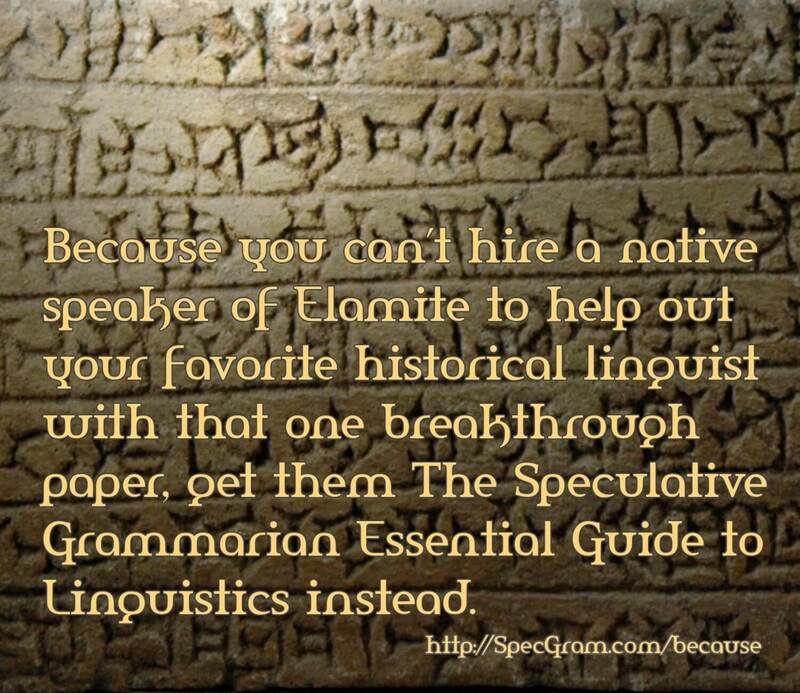 Instead, we can assure you that SpecGram has the right gift for your linguist loved one—a gift your favorite linguist will treasure for years to come: The Speculative Grammarian Essential Guide to Linguistics. 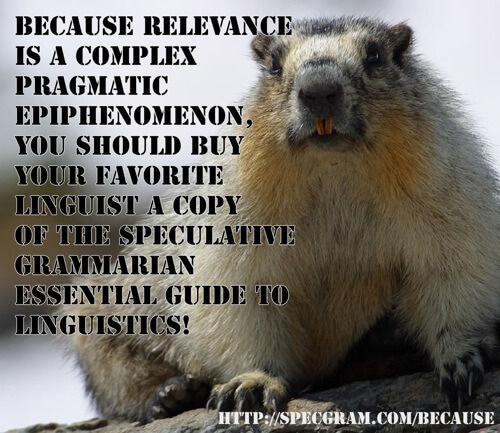 We’ve dedicated decades to bringing humor and laughter to linguists of all stripes, by making fun of all of them. 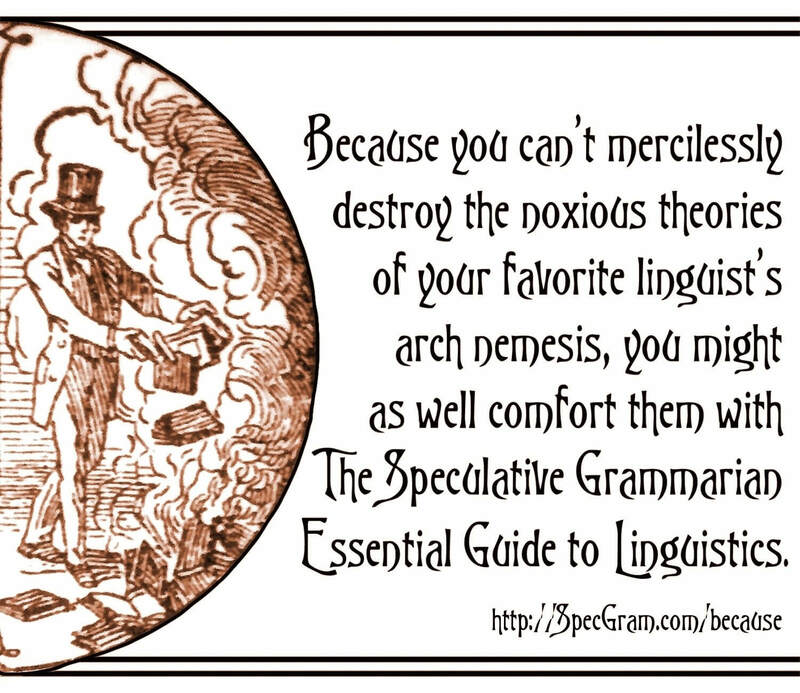 You don’t need to know whether your linguist is an anti-structuralist cognitivist, an anti-cognitivist functionalist, an anti-functionalist generativist, or an anti-generativist structuralist to give them a gift they will treasure for years to come. This book is the most fun a linguist can have with their clothes on—though we have to point out that while reading naked is not the unmarked condition, neither is it infelicitous. • If you know you're just going to have to take care of it yourself, check out 2015’s Hey Linguists!